An EWG analysis shows that from 2008 to 2011, water quality was rated "poor" or "very poor" at 60 percent of the 98 stream segments monitored by the Iowa Water Quality Index. The Index, produced by the Iowa Department of Natural Resources (IDNR), uses data from a stream-monitoring network created in 1999 to provide objective measures of how the state's free- flowing waterways are faring. EWG's analysis found that none of the sites had "excellent" water quality during the most recent 36-month period studied, and only one was rated "good." During the summer months, when Iowans flock to enjoy the outdoors, the Index ratings paint an even grimmer picture. Year after year, from May through August, the rankings of many more streams fall into the "very poor" or "poor" categories. During the three summers between 2009 and 2011, fully 80 percent (66 of 83 sites with complete data) had average ratings of "very poor" (7) or "poor" (59). That was 32 percent more than the year-round averages for those years, because comparatively better wintertime scores tend to offset the very bad scores of summer. The number of monitored streams rated "fair" dropped in half during summer months, to just 16, and only one held on to its "good" rating. The two pollutants most responsible for poor water quality ratings in the Index are nitrogen and phosphorus. In 55 percent of the monthly samples across all sites, nitrogen was the single worst pollutant, followed by phosphorus in 30 percent. Together, high levels of nitrogen and phosphorus set off a cascade of pollution problems that contaminate drinking water and damage the health of Iowa's streams and rivers. 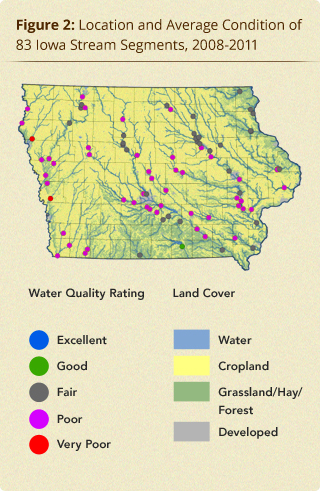 EWG's analysis found no evidence that Iowa's water quality has improved since 1999. To account for variations in weather and stream flow, we averaged the ratings for the 36 months from October 1999 to September 2002 and compared them to the average ratings for the most recent 36 months (October 2008 through September 2011). Of the 72 sites that have 36 months of data for both periods, the number of stream segments rated "good" dropped from three to one, while the number rated "fair" increased from 23 to 26. The number rated "poor" was unchanged at 43, and the number rated "very poor" dropped from three to two. Over the entire 12-year period, the condition of 16 sites improved, but 15 worsened. 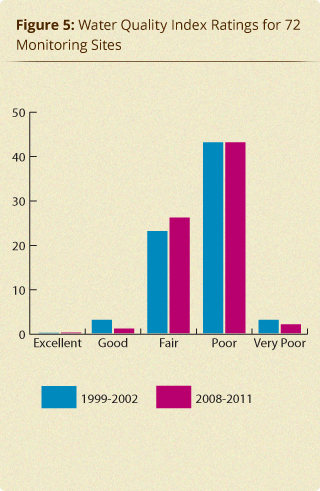 Only one – a site initially rated "good" that declined to "poor" – improved or worsened by more than one rank. The ratings of 41 out of 72 sites (57 percent) showed no change at all. 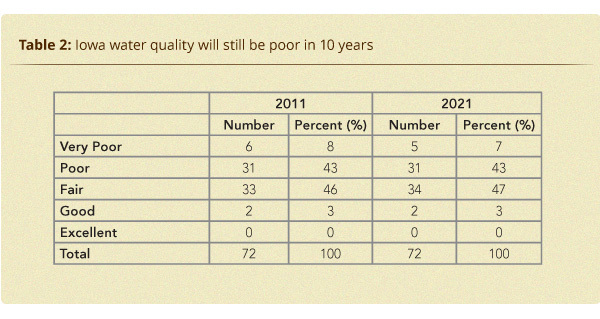 Worse yet, a statistical analysis of trends over the past 12 years predicts that Iowa's overall water quality will still be poor 10 years from now, given business as usual. Fifty percent (36) of the 72 stream segments analyzed will be in "poor" or "very poor" condition in 2021, compared to 51 percent (37) today. There still will be no stream segments ranked "excellent." Only two stream segments (3 percent) will be ranked "good," the same as today. Overall, water quality in 68 percent of the monitored stream segments is either declining or stable. At those sites where the statistics show a positive trend, the improvement is so slow that there will be little change over the next ten years. According to the Iowa Department of Natural Resources, fully 92 percent of the nitrogen and 80 percent of the phosphorus – the two pollutants most responsible for the poor condition of the waterways that the Index monitors – come from non-point sources. Only 8 percent of the nitrogen and 20 percent of the phosphorus come from "municipal and industrial discharges." Yet Iowa's water quality regulation almost exclusively targets municipal and industrial discharges, while agricultural runoff remains largely unregulated. Instead, Iowa relies on farm owners and operators to take voluntary measures to reduce pollution, and taxpayers pick up much of the cost. Iowa's towns, cities and industries don't have that choice. Under the federal Clean Water Act, they have been required to take often-expensive action to reduce pollution since 1977. To make matters worse, the already inadequate funding for programs that pay farmers to take action to reduce their pollution is shrinking. Funding for the five programs that provide most of the money totaled only $11.5 million in fiscal year 2013, 23 percent below the $14.9 million in fiscal year 2002. Iowa's rivers and streams can be clean, but only if Iowans take concerted action to reduce the nitrogen and phosphorus overload from agricultural operations. The good news is that experience and science make it clear that concerted action does result in major improvements. Iowa's voluntary programs could work much better if they were revamped to be more effective and were provided with a larger and more secure source of funding. The governor and the legislature must act to implement the Iowa Land and Water Legacy amendment endorsed by 63 percent of Iowans in 2010. The state's citizens voted to tax themselves to provide funding to clean up their water. It is time for Iowa's politicians to follow through. The Department of Agriculture and Land Stewardship must revamp the way voluntary programs are implemented to increase accountability, target resources to the right places, monitor and report on the farming and conservation practices used by farmers and make use of highly trained professionals to advise producers and make programs work. Revamping the way conservation programs are implemented will produce better results more quickly. But even the most focused and best-managed voluntary programs will not be sufficient to solve the water quality problems associated with agricultural production if they remain entirely voluntary. More money will help, but even massive increases in funding will not overcome the inherent weaknesses of relying solely on voluntary action. 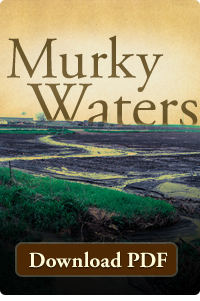 It is time to face facts – decades of working only with farmers who volunteer to reduce their polluted runoff has not achieved any overall improvement in Iowa's streams and rivers. This report shows that 40 years of the voluntary approach have failed to improve nitrogen and phosphorus pollution. EWG's 2011 report, "Losing Ground," similarly showed that 80 years of the voluntary approach had failed to adequately reduce pollution from sediment flowing off farm fields. The state must put in place smart and narrowly targeted regulations that curb poor farming practices. Regulations should phase out particularly risky practices such as planting crops right up to stream banks or allowing livestock unmanaged access to streams. Landowners and managers should be expected to control the ephemeral gully erosion that creates a direct pipeline for mud, fertilizer and manure flowing into streams and rivers. Many, if not most, farmers would agree that these activities are simply bad business practice and bad for agriculture's brand. Since the boom in corn and soybean prices, simply driving across Iowa provides compelling evidence that voluntary programs must be buttressed with smart regulation to ensure that proper conservation practices don't lapse. Conservation will have to become far more durable for there to be any hope of cleaning up Iowa's streams and rivers. Such regulations would establish a basic standard of care that comes along with the rights of land ownership. Voluntary programs can then be used to support those landowners and managers who meet these basic standards and want to do still more to clean up Iowa's rivers and streams. Precisely targeted regulation coupled with a strengthened voluntary program would set Iowa on a path toward cleaner water for our children and ourselves.